LOL I voted boy... Only because I was POSITIVE our little peanut was a girl... But we also have the hot dog :) Mommy's intuition.. Ha! I kept checking all day yesterday! Congratulations!! Congratulations!! I put my ultrasound on my blog too...do you think our kids will be scarred for life because thier boy parts are on the world wide web? Congrats!! Can't wait to hear the name of the newest Gregory! How did the appointment go other than that? How are you feeling? Take care. I would love to make something for your baby's room as a special gift - I have been praying so much for you and this baby and really want to make him (and you!) something. Awwww! A little weenie! 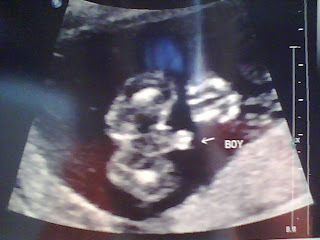 So excited for you- those boys will both grow up adoring their wonderful mama. As you know, I voted girl...and I proclaimed girl...and I was clearly WRONG!! I have two sons and it is awesome. Congrats!! What a cute blog name...I love it...loved reading some of your blog tonight and will be back often. Please stop in and see me and meet baby Jack, our little miracle.